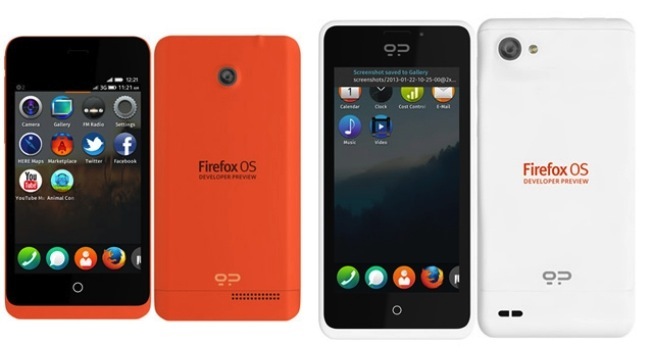 Geeksphone, the smartphone OEM startup based out of Madrid, put the first Firefox OS developer phones on sale early this morning, offering the Keon for $119 and the more powerful Peak for $194. Both devices are the first hardware to be offered with Firefox OS on board, and both devices are now listed as “Out of stock,” just a few hours after first going on sale. The Keon and Peak devices are essentially preview devices, designed to give developers the opportunity to test out what they can do with the new Linux-based open-source mobile operating system before it sees its general public launch this June in five initial countries, including Spain, Brazil, Portugal and Venezuela. The Geeksphone devices are modest in terms of their hardware specifications, but Firefox OS will likely be positioned as more of a mid-market play. The $119 Keon (yes, that’s unlocked pricing) has a 1GHz Qualcomm Snapdragon processor, offers 3G and EDGE cellular connections, has a 3.5-inch HVGA screen and a 3 megapixel camera. It’s got just 4GB of onboard storage and 512MB of RAM, but it offers a MicroSD slot for capacity expansion. The $194 Peak has a 1.2GHz dual core Snapdragon S4, a 4.3-inch qHD IPS display, an 8 megapixel rear and 2 megapixel front camera, and otherwise looks pretty similar to the Keon in terms of tech specs. Both devices are currently sold out, but TheNextWeb reported in a profile posted yesterday that Geeksphone was aiming to be able to fulfill orders at a rate of about 5,000 per day, and a call I made to Geeksphone’s offices revealed that the company is working hard on getting more phones back in stock, and hopes to have them on sale again this week, hopefully by Friday. Demand has been has been tremendous so far, a company rep told me. It’s hard to make any kind of predictions about Firefox OS’s potential success based on these very early results of two developer handsets, likely produced in small batches and aimed at an enthusiast crowd, but it’s definitely not a bad thing that they’re already flying off the shelves.